The life of a cattle rancher; what I assume many envision as this: days spent riding off into the sunset through mountain fields, newborn baby calves frolicking alongside as you go through checking on them, building a fence under a wide-open sky with wildflowers blooming around you, etc… In today's world with so many people removed from an actual working cattle ranch, I don't fault anyone for thinking this is what a cattleman's job consists of. In many ways, their visions are right. There is not a better career choice in the world…in my opinion. The wide-open sky is your office view, newborn calves are dang cute, and it's hard to find time better spent than in the saddle. However, most people don't see the not-so-glamorous side of things. They don't understand the actual hard work and heartache that comes from raising cattle for a living. 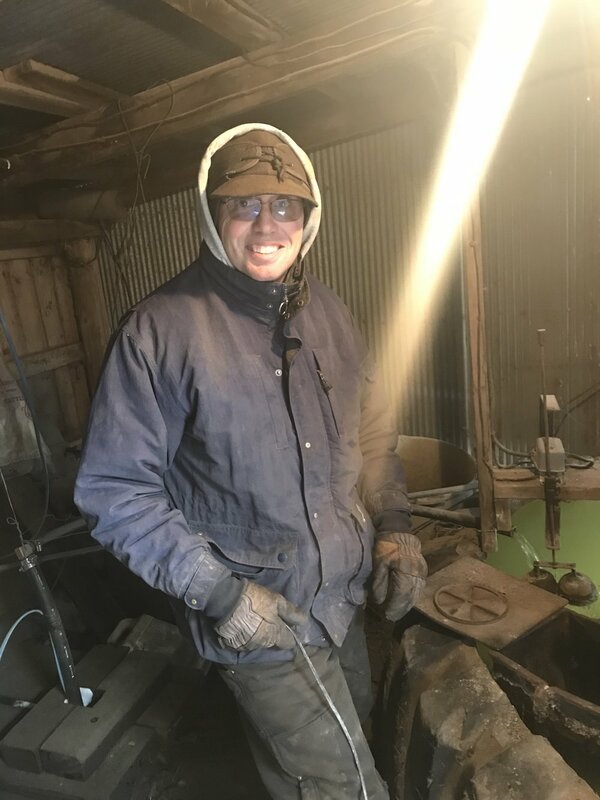 Lately, with temps dropping well below zero in many parts of cattle ranching county (near my family's ranch in North Dakota actually recorded the coldest place in the world on the 2nd of January, 2018), taking care of livestock is no dream-worthy task. But, there isn't an option because that's a rancher's job; to tend to his (or her!) herd, and they wouldn't have it any other way. So, for those who are not aware of what a rancher's day in the dead of winter in cold climates consist of, prepare to be enlightened. First on the to-do list: water. Livestock cannot survive without water. With everything frozen over in pastures and on the open range, it’s very important to have tanks/water holes that are kept open that allow access to such water. On my family's ranch, we have coal tank heaters. YES, I said COAL. 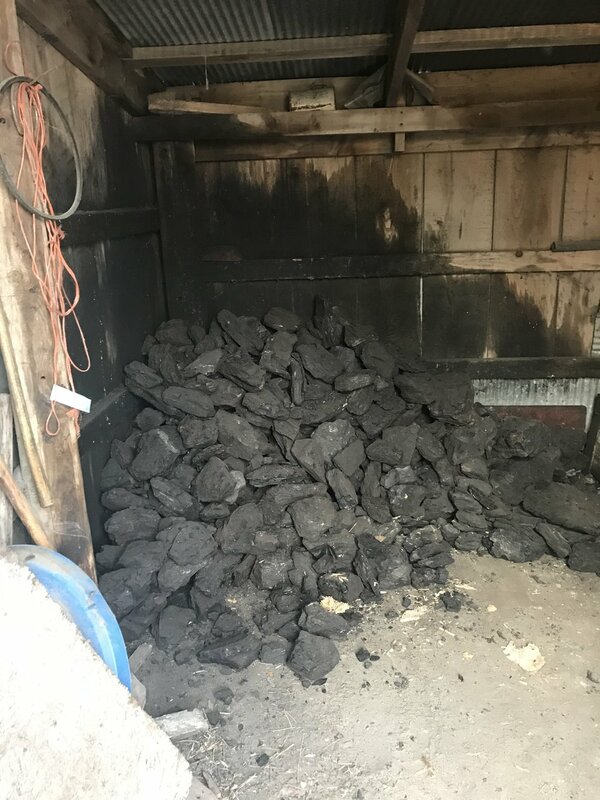 this is a pile of coal any cow would want for Christmas--it keeps their water heated! Lump coal to be exact. It's a pretty old-school method, but it is highly effective and extremely cost efficient. Coal is put into a cast iron stove that sits inside the water tank, and that heats the water and keeps it from freezing over. It needs to be stoked, and replenished morning and night. We also have some electric water heaters in some of the newer tanks, but this old-school coal heat is time tested and is working still with the fourth generation on our ranch. One thing I find interesting is that there are people in this world who believe all livestock should just exist on the open range with no shelters/enclosures. To each their own, and I respect their opinion. The reality is, cattle were domesticated 10,500 years ago, and they are not a "wild" animal. Unlike wild game animals that survive out in the open in extreme temperatures, finding their own water and forage, cattle require care and access to water and feedstuffs. If we were to let all of our cattle roam free and not look after them, the majority would most likely perish from the elements. Breaking ice day in and day out (another way to get access to water for livestock) during the winter months is not a task that anyone I know enjoys, but they do it because they know the cattle would not get water any other way (even when they are out on pasture AKA "free range"). Next is bedding and feed. -50 below zero windchill temperatures in the northern Great Plains requires a lot of straw and protection for livestock. It is absolutely necessary to spend several hours each day putting out the proper straw (usually made from the leftover wheat or barley crop) for the animals to bed down in. Our feedlot (the area that the younger cattle are enclosed in with protection and access to feed and water) has several homemade windbreaks on it, and the older mama cows on the pasture have their own windbreaks built for them as well. Grass and alfalfa hay is provided, since cattle can't graze when there is several feet of snow on the ground, and we also feed some homemade corn silage to add extra energy to the cattle's diet. More energy = more body heat generated = more warmth. Cattle spend most of their life on pasture, but when the weather turns this cold and snowy, it is important to keep them in closer quarters (many still on pasture) to be able to take better care of them. Interesting fact: bulls (male cows) need lots of straw around to keep their testicles from freezing and deeming them sterile. Nothing like it being so cold your balls freeze, right?! Finally, no matter how cold it is, good ranchers take the time to go through their cattle. They look for sickness and injury and treat any that need assistance. And when it comes time for calving (birthing) season, which is in the spring but still very cold, a whole other dimension is added as special care can be required to help a mother having trouble in birth. I have seen calves be brought into our house and blow dried off with a hair dryer to get them warm, but that's a topic for a whole different post. after a blizzard came through....believe it or not, the snow and straw keep them warm!